I was so excited when Jillian and Jake contacted me about their wedding. Jillian’s sister Celina, (and her husband Eddie) were one of my all-time favorite couples to work with and they continue to send me more awesome couples. I met Jillian & Jake for lunch and beers at their South Loop home before we started shooting. Our first stop was the Chicago Riverwalk. 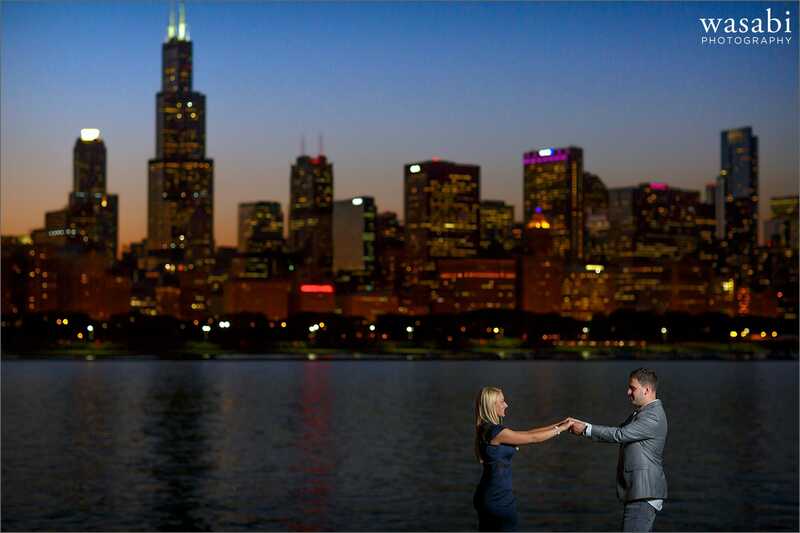 It’s a go-to spot for weddings, but I always enjoy trying to find a way to make a new photo in that area. While we were there we also made stops at the classic Chicago bridges on La Salle Street and Kinzie Street. After the bridges we headed back to their place for an outfit change (and maybe another beer) before traveling out to Adler Planetarium. My friend, Amanda, met us their to help assist with lighting. Usually Adler is the end of the night destination, but Jillian & Jake were up for one more stop so we headed back into the loop. 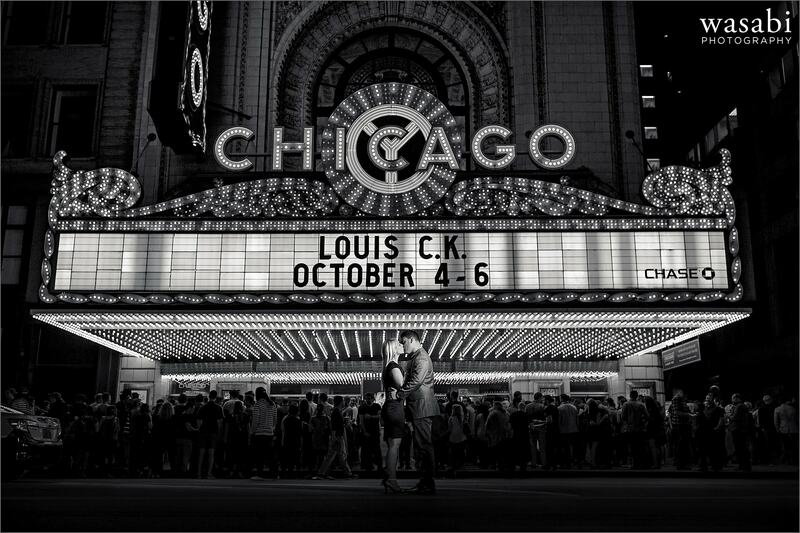 The iconic Chicago Theatre sign can be a great backdrop and also very technically challenging. 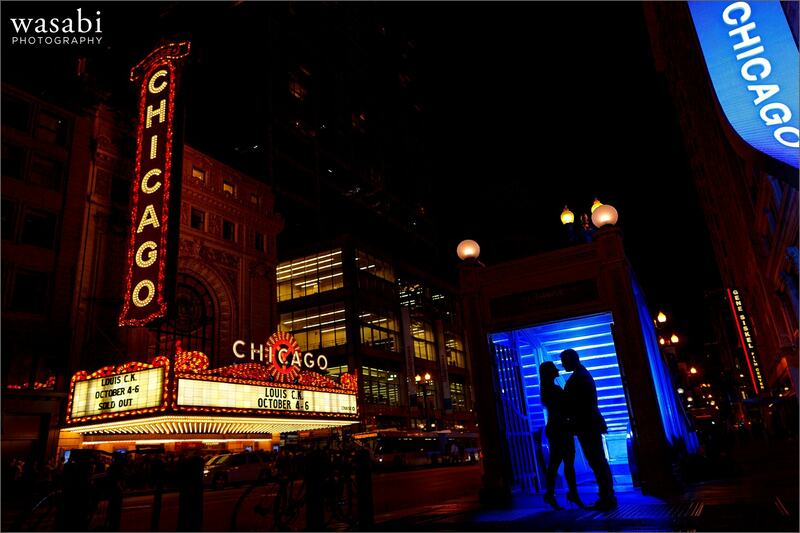 Chicago Theatre engagement photos can be difficult to manage with all the pedestrians and street traffic while balancing the marquee lights. But when it all works it’s totally worth it. Jillian & Jake were very patient as we waited for all the elements to come together and it resulted in my favorite engagement photo of the year. The last photo in the gallery was lit with a remote flash (and a blue colored gel) mounted inside the subway stairs. Thanks Jillian & Jake, It was great seeing you again and I’m already looking forward to your wedding next year!